Apple pie fruit tea - Monsieur T.
Whether it's snowing, raining or hailing, this fruit tea will give a pleasant and warming feeling. It’s even better with a warm blanket and your favorite woolen stockings. It's cold outside and you're looking for a little comfort? Don’t worry, Monsieur T. is here for you. This apple and cinnamon blend is perfect for your frozen fingers. Generous pieces of cinnamon and slices of apples mixed with almonds and hibiscus flowers will give you back your dexterity and “joie de vivre” in no time. 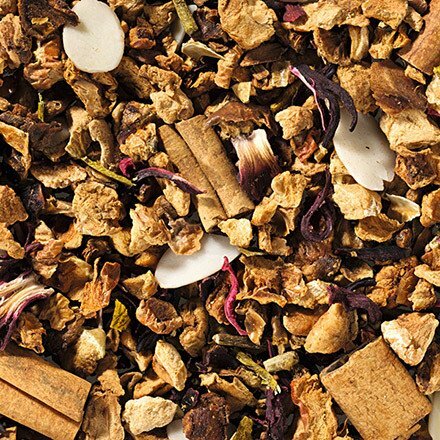 Contains: Apple pieces, hibiscus flowers, almond slices, cinnamon pieces, flavors, mistletoe flowers.